Home Lingerie	Cheery Cherry Undergarments! Here’s my personal ProTip for mystery fabrics that you just HAD to have but now don’t know what to do with: Turn it into undergarments! This cherry printed cotton jersey from Mood Fabrics is a great example of this theory put into action. When I found it on their website last month, I was immediately drawn to how freaking ADORABLE it is. Unfortunately, this isn’t a fabric that I would necessarily get a lot of use out of – I don’t wear a lot of sky blue, and I prefer my knits to be quite thin with a nice drape. 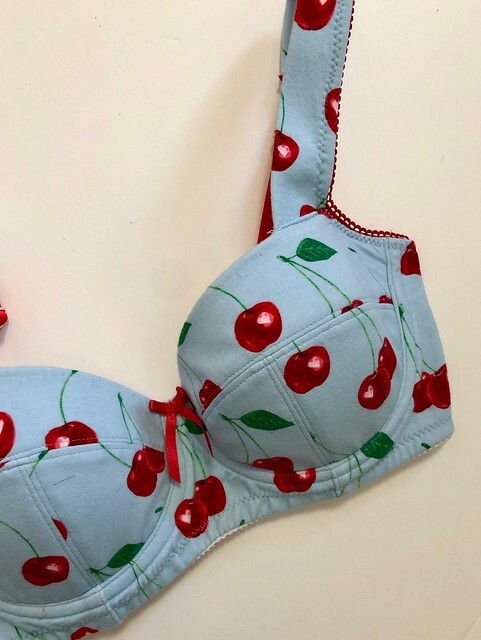 However, it was on mega discount and I do love me a good cherry print – so I figured I would make it into underwear! When it comes to my undergarments, ANYTHING goes! The world is my oyster! Looking at the Mood Fabrics website, it appears this fabric is sold out, but here are some other fun options of printed cotton jerseys that would work just as well: Birds, balloons, ladies fighting over a bridal bouquet, circus animals, owls/butterflies/cats/and… presents?, ladies dancin’, and peace signs… to name a few! So much weird goodness, I love it! This basic cotton jersey knit is a little on the thick side, and I knew it would work well for a foam cup bra (this way, the fit of the cup doesn’t depend on the fabric stretching any certain amount, since it’s stretched over foam). 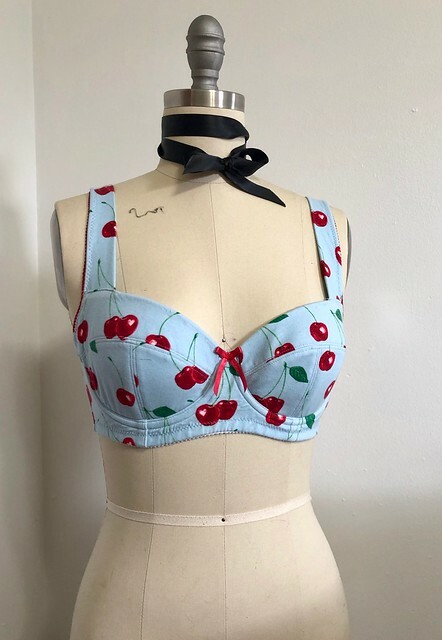 I used the Boylston Bra pattern from Orange Lingerie, as it designed to be made with sewn foam cups. To prepare my knit fabric, I started by block fusing the entire piece with lightweight weft interfacing. 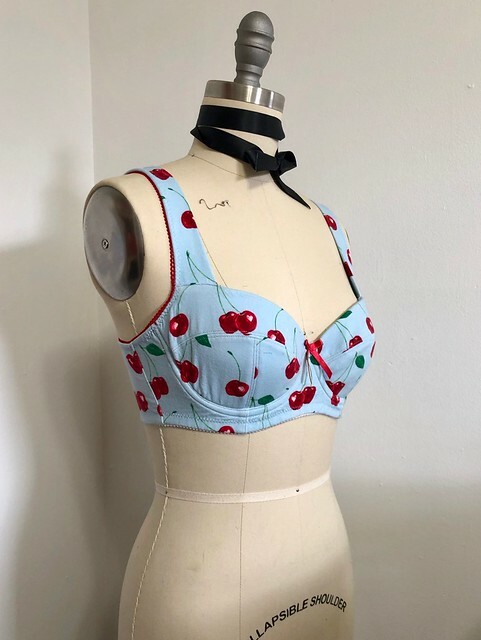 This stabilizes the fabric so that it no longer stretches, which makes it work well for bra-making (while a little mechanical stretch is necessary for fit/comfort, you don’t want the full-on crazy stretch that comes with a knit fabric except at the back band of the bra). I block-fused and then cut all my pieces out, except for the back band pieces which I cut from un-fused knit (so they would stay stretchy). I also cut foam cups with white bra foam, and used white sheer cup lining for all the band pieces except for the back band. For those pieces, I cut white powernet mesh to line under the knit pieces. This will allow those pieces to stretch, but keep them supported so they don’t bag out. If this sounds like a lot of work – well, it was a lot of pieces to cut! But they are all small so it was cut quite quickly. I actually moved house a couple of weeks ago and this was one of the last projects I cut when my sewing room was mostly packed and completely unusable. And it’s the first project I sewed in my new house! With all the cutting out of the way, sewing only took a couple of hours! 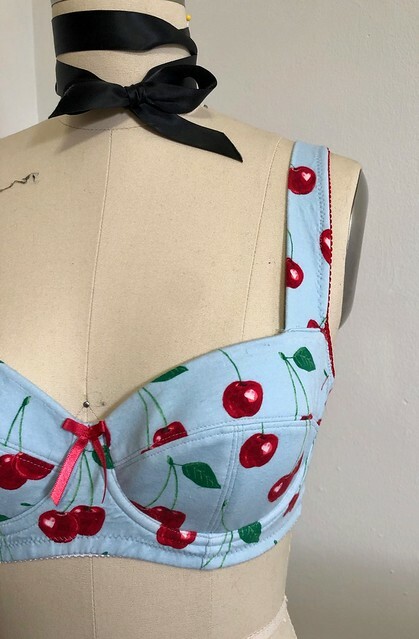 I sewed this exactly as I would any bra from any fabric – using the same stitches, threads, and a ballpoint needle. The only difference was that I did need to trim pretty aggressively where there were multiple layers of fabric, as the fused knit was pretty thick. One really nice thing about doing this with knit fabric was that it didn’t fray – at all! Man, I love knits. I bought quite a bit of this fabric, so I had plenty leftover to make matching undies (and later, maybe some matching knit pjs – because I still have more!). These were quick and simple, using the Acacia Underwear pattern from Megan Nielsen. I used the same cherry knit (obviously unfused, because underwears needs to stretch!) and red stretch foldover elastic to finish the edges. These were so fast to make – seriously, I think they took 10 minutes. I love me some speedy sewing! 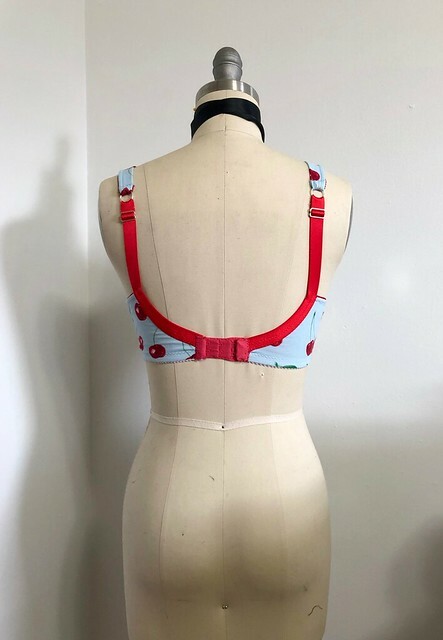 I’m really happy to have this fabric as an undergarment – like I said, I don’t think I’d wear it if it was “real clothes” (as cute as the print is, the color and thickness of the fabric just aren’t something I like to wear!) but it works great as a little underwear/bra set!